Cheetah Plains provides you with a warm, luxury African atmosphere that encourages guests to relax and become one of the Cheetah Plains family. Cheetah Plains provides you with a warm, luxury African atmosphere that encourages guests to relax and become one of the Cheetah Plains family. 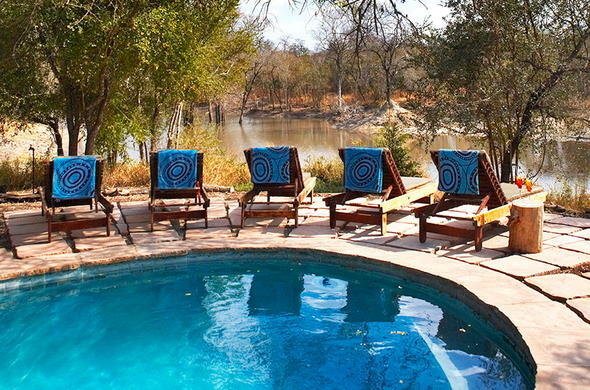 The lodge consists of luxury thatched chalets and one cottage, individually situated in indigenous gardens, each room equipped with air-conditioning and en-suite bathrooms. Removed fences between the lodges and Kruger National Park allow the wildlife free movement as they once did across vast stretches of grazing land. Therefore Cheetah Plains is part of the vast Kruger National Park. Game drives at Cheetah Plains do not only concentrate on the 'Big Five', but also offer information about the reserve's history and the life of local communities. Cultural visits of the local Utha and Dixie people are a unique opportunity to learn more about their life alongside wild animals.